Manchester and China Entering a "Golden Era"
Chinese President Xi Jinping is visiting <?xml:namespace prefix = st1 ns = "urn:schemas-microsoft-com:office:smarttags" />Manchester on the second leg of his State Visit to the UK. 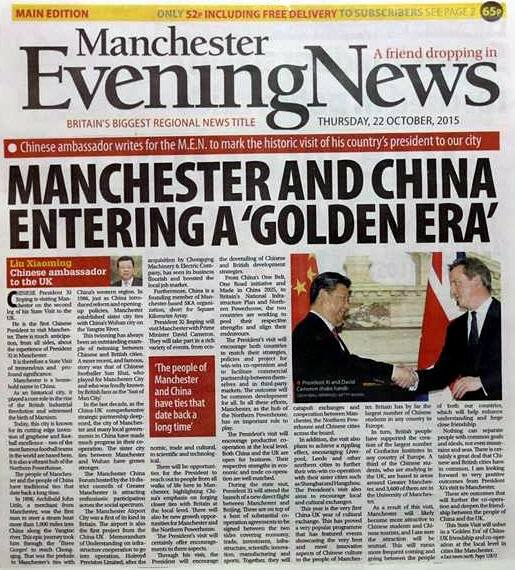 He is the first Chinese President to visit Manchester. There is much anticipation, from all sides, about the experience of President Xi in Manchester. It is therefore a State Visit of tremendous and profound significance. Manchester is a household name in China. As a historical city, it played a core role in the rise of the British Industrial Revolution and witnessed the birth of Marxism. Today, this city is known for its cutting edge invention of graphene and football excellence – two of the most famous football teams in the world are based here. It is also a vibrant hub of the Northern Powerhouse. The people of Manchester and the people of China have traditional ties that date back a long time. In 1898, Archibald John Little, a merchant from Manchester, was the first man to steer a steam boat more than 1,000 miles into China along the Yangtze river. This epic journey took him through the 'Three Gorges' to reach Chongqing. That was the prelude to Manchester's ties with China's western region. In 1986, just as China introduced reform and opening-up policies, Manchester established sister city ties with China's Wuhan city on the Yangtze River. This twinning has always been an outstanding example of twinning between Chinese and British cities. A more recent, and famous story was that of Chinese footballer Sun Jihai, who played for Manchester City and who was fondly known by British fans as the "Sun of Man City". In the last decade, as the China-UK comprehensive strategic partnership deepened, the city of Manchester and many local governments in China have made much progress in their co-operation. The sister city ties between Manchester and Wuhan have grown stronger. The Manchester China Forum hosted by the ten district councils of Greater Manchester is attracting enthusiastic participation across the social spectrum. The Manchester Airport City was a first of its kind in Britain. The airport is also the first project from the China-UK Memorandum of Understanding on infrastructure cooperation to go into operation. Holroyd Precision Limited, after the acquisition by Chongqing Machinery & Electric Company, has seen its business flourish and boosted the local job market. Furthermore, China is a founding member of Manchester-based SKA organization, short for Square Kilometre Array. President Xi Jinping will visit Manchester with Prime Minister David Cameron. They will take part in a rich variety of events, from economic, trade and cultural, to scientific and technological. There will be opportunities for the President to reach out to people from all walks of life here in Manchester, highlighting China's emphasis on forging closer ties with Britain at the local level. There will also be new growth opportunities for Manchester and the Northern Powerhouse. The President's visit will certainly offer encouragements in three aspects. Through his visit, the President will encourage the dovetailing of Chinese and British development strategies. From China's One Belt, One Road initiative and Made in China 2025, to Britain's National Infrastructure Plan and Northern Powerhouse, the two countries are working to pool their respective strengths and align their endeavours. The President's visit will encourage both countries to match their strategies, policies and project for win-win co-operation and to facilitate commercial partnership between themselves and in third-party markets. The outcome will be common development for all. In all these efforts, Manchester, as the hub of the Northern Powerhouse, has an important role to play. The President's visit will encourage productive co-operation at the local level. Both China and the UK are open for business. Their respective strengths in economic and trade co-operation are well matched. During the state visit, President Xi will attend the launch of a new direct flight between Manchester and Beijing. These are on top of a host of substantial co-operation agreements to be signed between the two sides covering economy, trade, investment, infrastructure, scientific innovation, manufacturing and sports. Together, they will catapult exchanges and cooperation between Manchester, the Northern Powerhouse and Chinese cities across the board. In addition, the visit also plans to achieve a rippling effect, encouraging Liverpool, Leeds and other northern cities to further their win-win cooperation with their sister cities such as Shanghai and Hangzhou. The President's visit also aims to encourage local and cultural exchanges. This year is the very first China-UK year of cultural exchange. This has proved a very popular programme that has featured events showcasing the very best and most innovative aspects of Chinese culture to the people of Manchester. Britain has by far the largest number of Chinese students in any country in Europe. In turn, British people have supported the creation of the largest number of Confucius Institutes in any country of Europe. A third of the Chinese students, who are studying in the UK, are based in areas around Greater Manchester, and 3,600 of them are in the University of Manchester. As a result of this visit, Manchester will likely become more attractive to Chinese students and Chinese tourists, and I am sure the attraction will be mutual. This will mean more frequent coming and going between the people of both our countries, which will help enhance understanding and forge close friendship. Nothing can separate people with common goals and ideals, not even mountains and seas. There is certainly a great deal that Chinese and British cities have in common. I am looking forward to very positive outcomes from President Xi's visit to Manchester. These are outcomes that will further the co-operation and deepen the friendship between the people of China and the UK. This State Visit will usher in a "Golden Era" of China-UK friendship and co-operation at the local level in cities like Manchester.